It’s the half-moon holidays in gloomy Nocturnia which means no school for Amelia and her friends! Instead they are going to spend it with their Rainbow Rangers troop, (lead by unicorns Ricky and Graham) earning badges on Sugar Plum Island. But whilst exploring, Amelia and the gang stumble upon an ancient curse – and are shrunk to the size of bugs! How will they make the bloodcurdlingly BIG journey to break the curse when they are all so very TINY? When she's not trying to take over the world or fighting sock-stealing monsters, Laura Ellen Anderson is a professional children's book author & illustrator, with an increasing addiction to coffee. She spends every waking hour creating and drawing, and would quite like to live on the moon when humans finally make it possible. Laura is the creator of EVIL EMPEROR PENGUIN and illustrator of WITCH WARS, as well as many other children’s books. 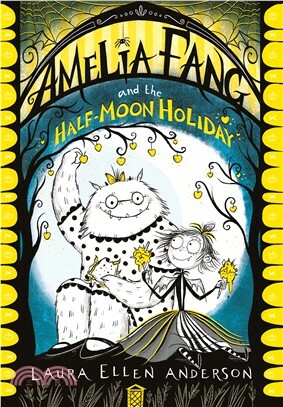 AMELIA FANG is her first series as author-illustrator.